Brothers, Doug and Bill Storey are the partners of Two Storey Building. We created Two Storey Building because we love to build. Custom homes, additions, interior and exterior renovations, kitchen and basement remodeling, garages, decks, sunrooms- you name it, we've done it. We both have been building our whole lives. We have decades of experience in the building trade. In 2001, we decided to start our own contracting business to best make use of our talents and to pursue our dream of managing our own business. Doug Storey (on the right) started in the building trade while in high school and continued after college. After several years in the building trade, he attended graduate school in Washington, DC and then spent many years in the marketing and advertising business. Before starting Two Storey Building he was Vice President, Director of Operations, for Holland Mark Advertising in Boston where he also supervised several multi-million dollar renovation projects of corporate office space. In January of 2001, he started Two Storey Building and returned to his true passion, building, full time. Doug is the Managing Partner of Two Storey Building and in that capacity Doug handles the business management of the company including operations, sales and marketing, estimating, contract negotiation, project management, customer service and scheduling. that involves almost daily interaction with all of our customers. Doug and his wife Kim live in Bolton and have three sons, a dog and two cats. Bill Storey (right) has worked in the building trade for over 25 years. He has worked for several building contractors over the years. Bill developed experience in all aspects of the building trade from framing to finish work in both residential and commercial projects. Prior to starting Two Storey Building, Bill worked for Integrated Builders of Braintree, MA where Bill has worked as a carpenter and supervisor of construction projects, including work for clients such as EMC, Intel, Bose, and U-Phoenix. Bill is the Production Supervising Partner of Two Storey Building and in that capacity Bill handles the project management side of our business, managing jobs, subcontractors and our employees as well as continuing to handle much of the finish work on our jobs. Bill and his wife Traci have a Brady Bunch family with five kids, with Bill's two daughters and Traci's two sons and daughter. Mat Friend is our Lead Carpenter and has worked with Two Storey Building since our start in 2001. He manages many of our toughest projects. He is a skilled carpenter and is proficient in finish work. He also worked with Bill and Dave at Integrated Builders for several years. Mat recently built his own new home from the ground up. Mat and his wife Megan have two children. 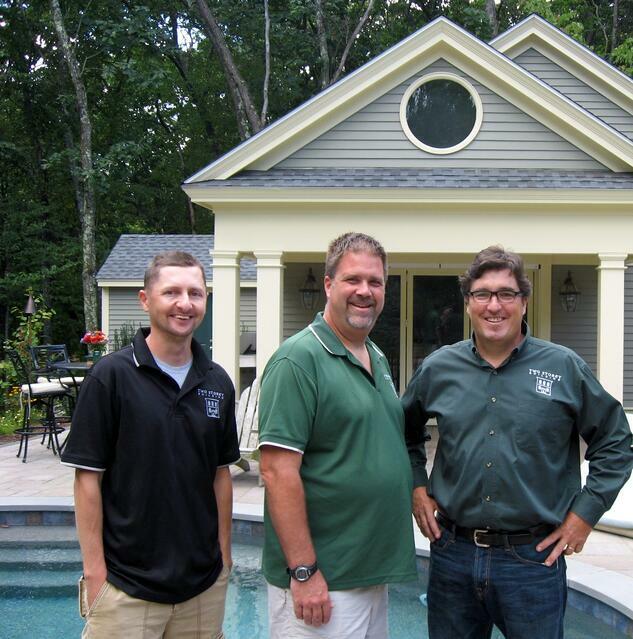 Doug, Bill, and Mat are all licensed Construction Supervisors in the state of Massachusetts. All of us are Certified Remodelers under the EPA RRP Lead Paint law. Two Storey Building carries the appropriate and current liability and comprehensive insurance coverage for all work that we perform. Master Carpenter In Memoriam - Dave Jones. Our dear colleague Dave left us in 2008 but he will never be forgotten. He is with us every day as we go about our jobs. We think of him often and of the many ways he touched our lives. He taught us to build every project the right way, not to cut corners, to be safe, to be friendly and courteous to everyone we work with and to enjoy life along the way.